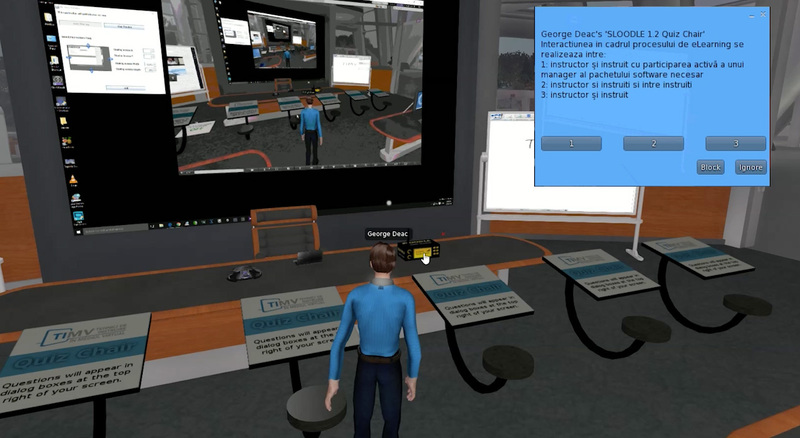 The immersive platform dedicated to distance learning integrates a host of instruments designed for teaching, learning and evaluation, such as: web browsing, screen sharing, video players, screens for graphic presentations, virtual library, live streaming, webcam, videoconference, VoIP, chat, whiteboard, automatic clock in systems, interactive evaluation systems (quiz chair, 3d quiz). For an easier content administration and user progress monitoring, the platform can be integrated into existing LMS systems, such as Moodle or eFront. The platform allows for the import of 3D items in collada format (.dae), created in any 3D software or their importing from Google Warehouse, so that subsequent 3D development of platform becomes easy for any user. The platform is designed in a server-client architecture, therefore any user generated content change is saved onto the server and viewed in real time by the other users. For the platform to be a genuine support in the educational process, we developed a series of applications available directly in the virtual world, such as: Whiteboard-type presentation table available in any class room, presentation screens, which allow the accessing of any web page or internet application (wiki spaces, google docs, wallwisher, google forms etc. ); Study screens (tutorials), webcam screens, through which the teacher, a guest or students can be displayed in real time via live streaming; videoconference system, available through a click on the video interphone on the teacher’s desk in the class room, Screen Sharing application, available through a click on the laptop on the teacher’s desk, which allows for the sharing în the virtual world of any computer screen, for the purpose of integrating PowerPoint, Prezi presentations or any graphic teaching support materials. Communication within the platform can be achieved asynchronously via messaging or synchronously via text chat, audio chat or videoconference. Through Webintercom, a connection can be established between the text chat system on the 3D platform and the existing Moodle one, so that users on both platforms can communicate with each other. To optimize communication, the platform includes a series of gestures to illustrate the non-verbal side. They can be configured in the Gestures panel, which can be accessed by right clicking on the avatar. 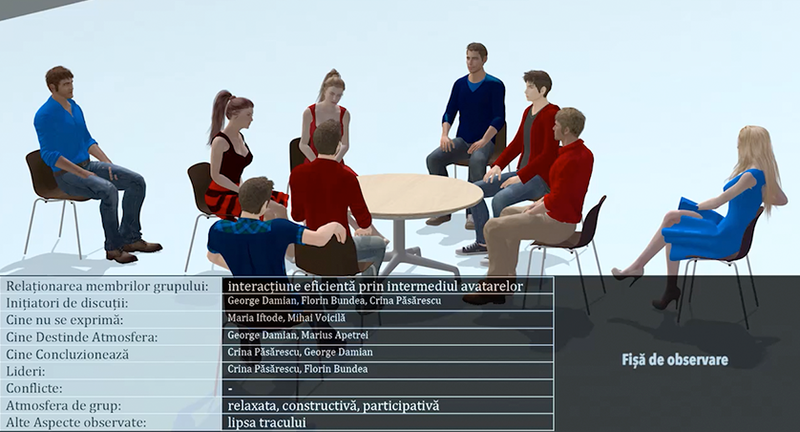 The client application can be integrated with Microsoft Kinect, so that the gestures of the user in real life can be replicated by their avatar. The avatar can be manipulated through commands similar to any MMORPG (Massively multiplayer online role-playing games) platform, through arrow buttons and the mouse. The mouse’s scroll wheel can change the position of the 3D camera. By zooming into the avatar, we change to first person view (which means that we see the world through the eyes of the avatar). PageUp and PageDown keys make the avatar fly. PageUp lifts the avatar, while PageDown brings it down. Interaction with items in the real world can be achieved by clicking left or right on the mouse, to display contextual menus. Teleportation panels are incorporated for fast access to various area of the campus. For a better immersion in this virtual world, the platform can be accessed through Oculus Rift, virtual reality headset and various haptic peripheral devices. The platform includes a series of teaching tools essential to the evaluation process, such as Quiz Chair, Choice, Quiz Pile On and automatic or interactive clock in instruments such as Tracker Scanner and Tracker Button. Messages generated in his way are stored in the Activities section of the Moodle platform. Every student desk has a monitor with web access, so that everyone can view the teaching support materials on Moodle or any other site. Teaching rooms have shelves with books which can be connected to a virtual library. By clicking on one of the books on the shelves the user will be able to access a PDF version of the book or paper. The avatars can take notes during classes or free activities, through Notecards, available in the Inventory panel, by selecting Create / New Note. After editing and saving the notes, the content will be available in the Inventory panel in Notecards folder. The main building has an auditorium, which can host presentations or conferences with a larger number of users. 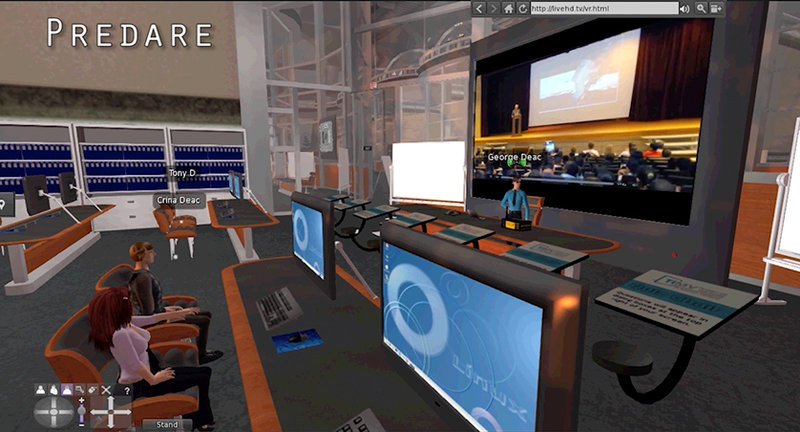 The avatar who delivers the presentation at the desk can be heard by all attendees. The screen behind it displays graphic elements to support the presentation.